This antibody was raised against an immunogen that is predicted to react with HSV-1. We do not expect this product to react with HSV-2. Abcam welcomes customer feedback and would appreciate any comments regarding this product. Synthetic peptide derived from within the activation domain (amino acids 413-490) of HSV VP16. 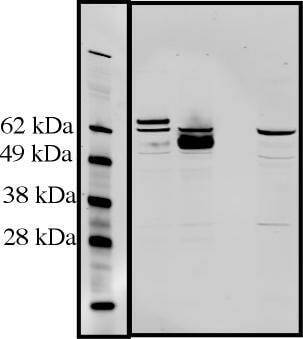 This antibody recognises GAL4-VP16 recombinant fusion protein (30kDa) in Western blot. Our Abpromise guarantee covers the use of ab4808 in the following tested applications. WB 1/500 - 1/2000. Detects a band of approximately 30 kDa. ab4808 at a 1/100 dilution staining mouse brain sections by Immunohistochemistry (Formalin-fixed paraffin-embedded sections). Following heat mediated antigen retrieval, the antibody was incubated with the tissue for 24 hours. 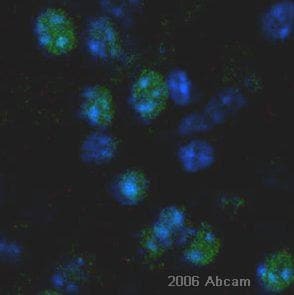 Bound antibody was detected using an Alexa-Fluor 488 ® conjugated Donkey anti-Rabbit IgG. This image is courtesy of an Abreview submitted on 10 March 2006. Publishing research using ab4808? Please let us know so that we can cite the reference in this datasheet. Thank you for your inquiry. Unfortunately, I am sorry this antibody has not been tested for detection of the endogenous full length tetracycline reverse transcriptional activator protein. It is quite likely to detect, as the VP16 tag is from the C terminus of this protein as far as I am aware. However, we would not be able to guarantee how well it would work for detection of rtTA. Regrettably, we have no other antibodies in the catalogue raised against rtTA. I would like to recommend checking the Biocompare website which has an excellent antibody search facility that includes many suppliers. The links are: www.biocompare.com http://www.biocompare.com/ProductCategories/2045/Antibodies.html I am sorry we do not have an antibody tested for your requirements on this occasion. However, I hope this information is nevertheless helpful to you. Please do not hesitate to contact me if you have any further questions. 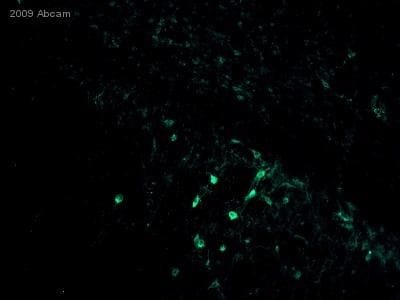 BATCH NUMBER 116137 ORDER NUMBER -- NOT SPECIFIED -- DESCRIPTION OF THE PROBLEM No signal and non specific staining specific staining should be in the hippocampus, and there is no staining in my specimen. non-specific staining appear in purkinje cells in the cerebellum in vp-16 negative and positive brains. SAMPLE brains of transgenic mice camkII-tTa. VP16 is a part of the tTa element. DETECTION METHOD AEC POSITIVE AND NEGATIVE CONTROLS USED brains of non transgenic mice as negative control. The positive brains were positive in genotyping as well as in the phenotype. ANTIBODY STORAGE CONDITIONS 4 degrees FIXATION OF SAMPLE formalin-fixed paraffin embedded ANTIGEN RETRIEVAL citrate ph6 - microwave PERMEABILIZATION STEP non BLOCKING CONDITIONS 1% BSA in PBS SECONDARY ANTIBODY vector - universal anti mouse+rabbit HOW MANY TIMES HAVE YOU TRIED THE APPLICATION? 2-3 DO YOU OBTAIN THE SAME RESULTS EVERY TIME? Yes WHAT STEPS HAVE YOU ALTERED? different antigen retrieval protocols: different buffers in the heating antigen retrieval (EDTA, Glycine) as well as pronase (1mg/ml) enzymatic treatmant. Thank you for your enquiry. I am sorry to hear that your customer has not been able to obtain satisfactory results using this antibody. I appreciate their frustration. I am assuming that your customer is using a transgenic mouse with a camkII-tTa-VP16 construct. We have received no complaints about this antibody to date. We have also received positive feedback from a customer that applied this antibody following paraformaldehyde fixation using an overnight incubation. My concern with the approach that your customer is using this antibody without permeabilization; something that is employed by the reviewer that I would consider necessary for use with this antibody. I would like to recommend the use of 0.1% Triton for this purpose. They also do not mention the dilution that they have been applying this antibody at. This antibody has been shown to give good results at a dilution of 1/100. I would recommend an overnight incubation at 4oC. It may also help if your cusomer reduces the dilution of the secondary antibody that they have been using. This combined with a primary antibody dilution of 1/100 can only serve to improve the results that you have been obtaining. Finally I would like to ask for clarification over the CamKII construct that they have been targeting. This antibody targets the VP16 activation domain within amino acids 413-490; can you tell me whether this protein construct contains full length VP16? I hope this information helps, please do not hesitate to contact us if you need any more advice or information. Is the epitope of the antibody located within the activation domain of VP16? Thank you for your enquiry. The VP16 activation domain is amino acids 413-490. The peptide that this antibody was raised to lies within this region. I hope this information helps, please do not hesitate to contact us if you need any more advice or information. Does this antibody recognize both tags, gal4 and vp16 alone, or does it only recognize the fusionprotein?? Thank you for your enquiry. This antibody recognizes VP16 only. The immunogen was derived from a synthetic peptide derived from residues 450 - 550 of HSV VP16 tag. I hope this information helps, please do not hesitate to contact us if you need any more advice or information.